When Rebecca is uprooted from her New York home, and sent to live with an aunt in New Orleans, she has a hard time adjusting. Her father has to go to China on business, and she misses him terribly. It’s simply difficult to fit into the “close” atmosphere of New Orleans, where old money and newcomers never mix, and each family has a skeleton in the closet. Rebecca’s aunt is a fortune-teller, and lives in a musty shotgun house crammed with artifacts. It’s located directly across from the cemetery. Rebecca has been warned never to enter it, but one night, she slips in…and makes a friend. Lisette is kind, helpful, and eager to talk. However, soon Rebecca realizes that no one else can see Lisette but her. Lisette is a ghost. The fact that Rebecca can see Lisette is significant. 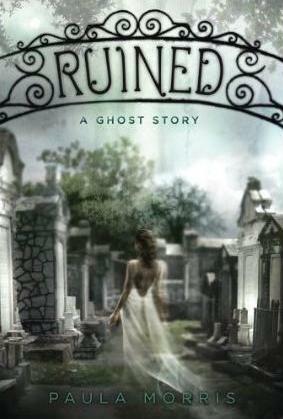 A century-old curse, New Orleans’ most prestigious family, and a dark secret create a dangerous environment for Rebecca, and it isn’t long before the truth comes out. So, here’s the thing: I am a sucker for ghost stories. When combined with curses, crumbling old houses, and cemeteries, I absolutely can’t resist. Whatever! It’s a preference. I can’t help myself. Furthermore, I whiled away thousands of hours, time when I could have been playing soccer or learning chemistry, reading my way through countless Scholastic books. You know, the ones that are sold in paper flyers that your teacher sends home from school. My mom used to buy tons for us, and I grew up with them. This Scholastic story was like so many of the others, and certainly didn’t disappoint. They are mass-marketed to students across the country: often light, engaging reads, sold in inexpensive paperback formats. A lovely friend gave this copy to me, and I’m grateful for it. It’s been rainy and gloomy all week long: the perfect setting for a ghost story. This one didn’t disappoint me, either. The only thing I could ask for would be a little more creepy-haunting business, and a little less high school drama. Other than that, this was exactly what I was hoping for: a ghost story in an interesting setting. Morris, Paula. Ruined. New York: Scholastic Books, 2009. 309 pp. Grades 7-10. Posted on May 17, 2011 May 17, 2011 by ShannaPosted in Ghost Story, Mystery, YA LitTagged balls, cemetery, Creole, curse, debut, ghost story, haunting, Mardi Gras, New Orleans, society.